Well I am doing well so far don't you think? Two posts in two days....lets just hope I keep it up. I used stamps by Chloe - if you have never used her stamps, take it from me they are excellent value for money, give good stamped images every time, easy to keep clean and loads of choice! So for the card I used a large square card and with the white card I matted a piece of silver mirri card and on the red card it was a piece of gold mirri card. I stamped a sentiment with versamark and heat embossed with gold or silver powder. Next the wreathe was stamped and again heat embossed. 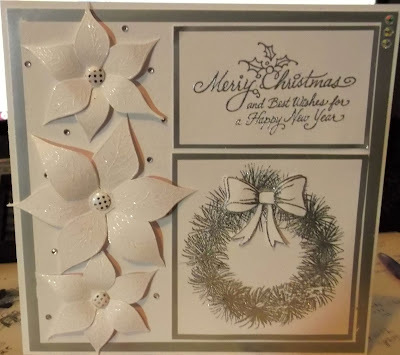 I stamped the bow twice on matching card, heat embossed them then cut out and decoupaged before sticking to the top of the wreathe. The flowers were stuck to the left of the card using cosmic shimmer glue. A few AB gems were placed in a line to the top right hand corner of the card. I do hope you like my card in two colours!